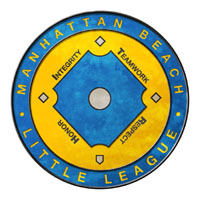 Click here for a map of all MBLL fields. Classic old-time park with good seating and snack stand. Skinned (dirt) field. Mostly used for softball, but shared with younger baseball leagues. Beautiful facility with batting cage, bullpen and the works. It is used for Junior hardball (13 & 14 year olds) only, because of the field dimensions. 900 Block of Valley Dr.
North and South fields at same location. Beautiful field with ample viewing stands. On the north end of Live Oak Park. Beautiful field with full facilities at the south end of Live Oak Park. The City will renovate and return the field to us for the 2006 season. Some MBLL meetings are held here. One field in a world-class 3-field complex opened in 2001. One field in a world-class 3-field complex opened in 2001. Newly skinned (dirt infield, no mound) for softball. Most of MBLL meetings are held here. Spectator seating is a challenge. Bring a lawn chair. Classic old-time Little League field. Dominguez Park. 201 Flagler. Just south of 190th Street in Redondo Beach. Traveling south on PCH, turn left at 190th Street. Travel east approximately ½ mile on 190th Street and turn right onto Flagler Lane. The SRLL field is located approximately two blocks south on the left side of the Flagler.